On a previous visit, Sauce On Hampton delivered a somewhat careless, but very promising, burger. We called ahead to make certain that the Chef/Owner, Sassan Rostamian, would be leading the kitchen. I had corresponded with the young chef, previously, and I was so impressed with his passion for food that I wanted to give him a second chance. Sassan was pronounced "Sauce On." This made the establishment's name a clever pun. Beyond that, Chef Sassan had an undergraduate degree in Chemistry, and his mother was/is a Dietitian. This promised to be an interesting burger. Sauce On Hampton was all about healthy, organic, seasonal, and locally-sourced ingredients. Fresh/never frozen, organic meats and market fresh produce dominated the menu. 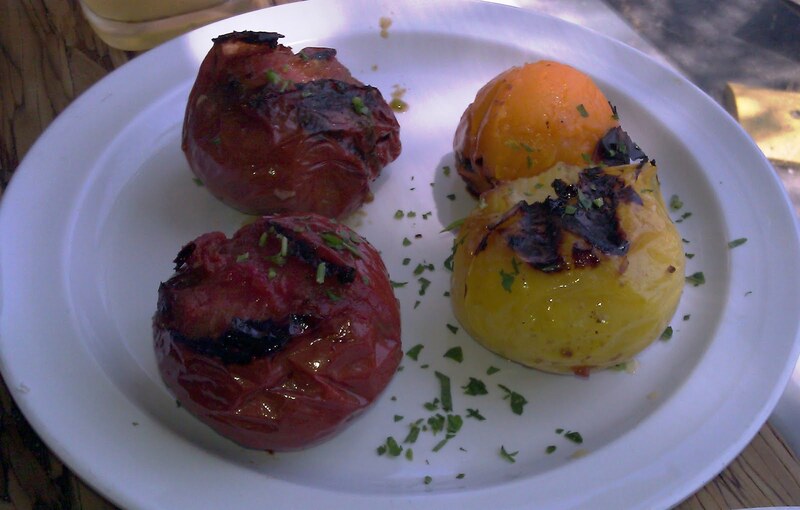 When we arrived, the chef was just returning from the farmer's market with heirloom tomatoes and some intensely flavored Nectaplums--if you've never tried a Nectaplum, then you have been missing out. Fat Bruce Lee and I ordered a couple of the "Classic, done right" burgers. These came with Cheddar and Applewood Bacon for $10 each. All burgers at Sauce On Hampton also came with tomato, baby spinach, red onion, house-made aioli, a special sauce, and Dijon mustard. We ordered all of that on the side. While we waited the 10 or so minutes for the cheeseburgers to cook, the chef and I geeked out over burger preparation. I was pleased to learn that the burger also came as a wrap. The chef and I shared a passion for burgers in that form. 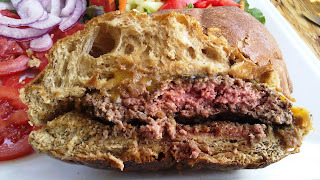 The Beef: The burger patty was 6.5 ounces of grass-fed, coarsely ground Chuck from Estancia Beef. The beef was ground locally at Premier Meats. The freshly ground beef was delivered fresh 6 times per week. The beef was wet-aged, and it had a fat content of 20%. On this visit, the beef delivered no notes of aging. It was nice and beefy, and it delivered a satisfying end note of minerals, which was unusual for Chuck. The burgers were satisfyingly juicy, and they had a nice flavor of carbon from the cast-iron griddle upon which they were cooked. The Seasoning: The burgers were gently dusted with a salty seasoning blend when they hit the griddle. This seasoning was only applied to one side of the burger patties. I thought that I would miss the salt, but I did not. The burger was quite flavorful, and the Cheddar pulled through like a boss. The beef blend was not seasoned prior to cooking. The Sear: The sear was nice. The cast-iron griddle put a carbon-heavy sear on the fresh-tasting beef. The Preparation: The burgers were cooked to the Medium, which we requested. The patties were prepped ahead, but only by a little. Generally, Sauce On Hampton pre-formed enough patties to get themselves halfway through lunch. This practice insured that the burgers did not sit around long enough to become chewy. It worked, and our burgers were juicy and toothsome. The chef was a pro, and he set the default for burger cooking to Medium. Med-Rare Chuck has always tended towards........blah. 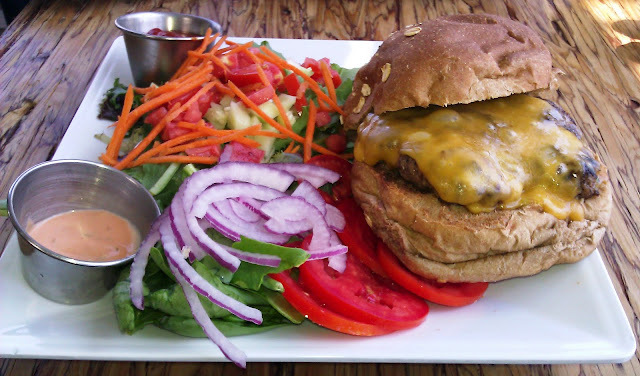 The Cheese: The Cheddar, which topped the burger patties was perfectly melted, salty, and sharp. The cheese was melted under one of those burly, industrial broiling units known as a Salamander. The Bun: This was a whole wheat, oat-topped, mildly-toasted, bespoke burger bun. The bun was sourced with great care from a local bakery, which the chef kept a secret. The bun was hearty in flavor without being heavy or bready. The Fries: No fries were on the menu at Sauce On Hampton. Fat Bruce Lee had the roasted potatoes, and I had the mixed green salad. I couldn't speak for the quality of the potatoes, but the salad was fantastic. Every bit of veg on the plate was absolutely phenomenal. The Toppings: The baby spinach was ridiculously fresh, and it was quadruple washed to rinse away all traces of grit. The heirloom tomatoes were crimson, perfect, and rich with flavor. The thick slices of apple wood-smoked bacon were delicious. Sides: The chef was kind enough to bring out a flight of his roasted, whole heirloom tomatoes. If you don't want a burger, you still need to go to Sauce On Hampton to sample this culinary revelation. These juicy, firm, tender mouthfuls tasted more like roasted apricots than tomatoes. This alone was worth the trip. 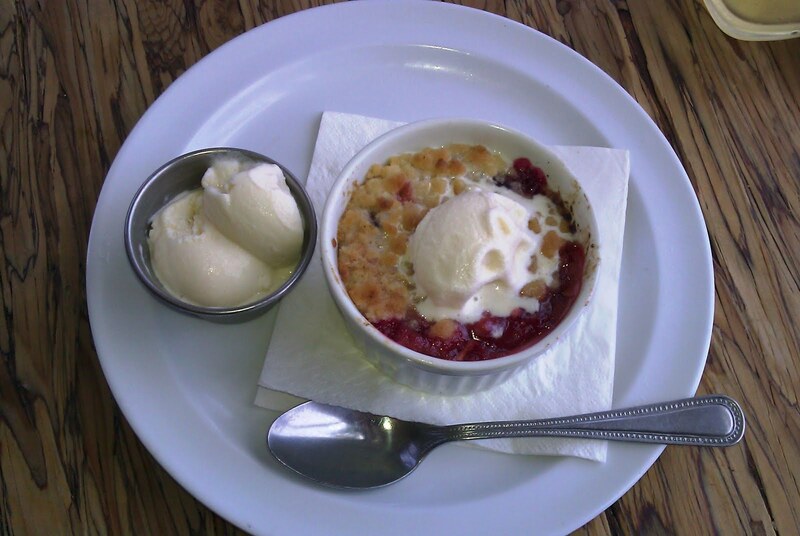 We also a tried the Pluot Crumble. This was made from Flavor King pluots, and it was a delight. The hint of cinnamon caused the flavor to intensify to the point of forcing a grin to our faces. Chef Rostamian was a food geek, but he was especially a fruit geek. The Value: $10 for a very good cheeseburger with some of the most amazing produce was a fine value at Sauce On Hampton. It was odd. After eating our cheeseburgers, Fat Bruce Lee and I felt refreshed...like we had just eaten a healthy meal. Sauce On Hampton delivered a lively, fresh, flavorful cheeseburger. I would strongly urge anyone to go there for the produce alone. Also, the chicken sandwich was HUGE. It was about 1/2 pound of fresh chicken breast on a bun with a pile of fresh greens. I also sampled the burger with all of the toppings, and when fully topped the burger was elevated a notch. The bacon and tomato slices filled in where the beef was lacking. This created a full-bodied, full-flavored bite. Burger Review : The burger at Sauce On Hampton was an example of the goodness, which occurs when superior ingredients are prepared by a skilled hand with an emphasis on fresh flavors. 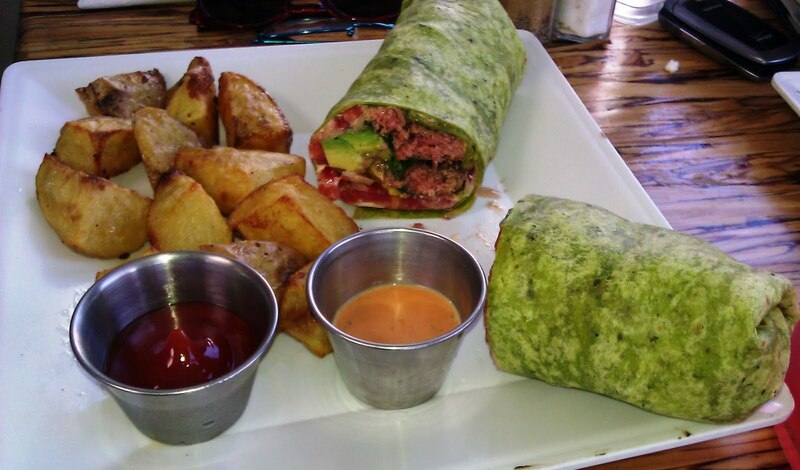 This was one of the few burgers, which we have sampled, that actually tasted healthy. I have to imagine that the chef's mother is proud of the nutritious dishes being prepared at her son's restaurant.